If there is any one thing that defines this issue, its confusion. It doesn’t exactly make any kind of sense and it doesn’t explain anything about the Secret Society. This is merely a prologue to Trinity War, or an interlude to Forever Evil #2 at best. This is not a Villain’s Month one-shot. And in that respect, it is very much the same as Greg Pak’s Batman/Superman #3.1: Doomsday. That too was a chaotic and confusing issue, where the featured supervillain barely featured at all. If this had been an origin story for the Secret Society, that would have been great. If this had been a direct tie-in for Forever Evil, that would have been great too. It is neither of these things. The story here is about the before and the after of the event that drove Earth 3’s Alfred Pennyworth aka The Outsider and Earth 3’s The Atom, Rhonda Pineda aka Atomica, to Earth Prime. We see Owlman (Thomas Wayne) go up against his world’s The Joker. We see the invasion of a never-before-seen power, an event that worries even Ultraman, the most powerful man on Earth 3. We see the barest glimpses of The Outsider forming the Secret Society on Earth Prime. We learn the reasons that made Superwoman capture Nightwing when she was breaking out the inmates of Arkham Asylum in Forever Evil #1. In and of itself, each of these events is a promising and incredible story in itself, but thrown together, they create a really disparate story that barely connects together. We are introduced to so many plot points but there are no resolutions. This is what I call a pseudo-dark issue, one where the writing and the art are attempting to tell a really dark story, but it all falls flat because the execution of it is so poor. 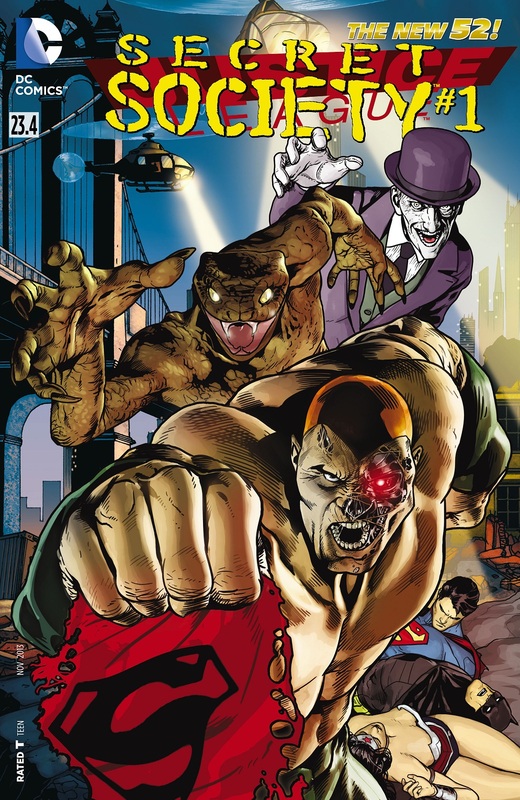 The opening pages themselves present a very contradictory image of the Earth 3 version of Gotham. This is a world where there are no heroes, just villains. Where the cops are all corrupt, but the people even more so. It is a world where the people run through the city in apparent fear for their lives but when they are stopped by these corrupt cops, its the people who gun down the cops. Or try to at least. For the art itself, I didn’t like it. Artist Szymon Kudranski, colourist John Kalisz and letterer Taylor Esposito try to deliver a more gothic vision of Gotham than anything else we’ve seen in the New 52. It works to a degree, but there are so many shadows and black inks prominent throughout that the panels lose definition and clarity, especially since the entire story takes place during night time. Keeping character faces and bodies shrouded in shadows can only work so far without coming across as excessive. And that was the case here. The art was just plain unappealing. As with so many other Villain’s Month issues that failed to work for me this month, Justice League #23.4 feels forced and doesn’t exactly fit into the concept of the entire month-long event. It would have been far better to have seen this kind of a story played out in backups to Forever Evil rather than in one-shots like this. Now that would have contextualised this story better. Right now, it just means that Geoff Johns delivered a disappointing issue. The contents of the comic just don’t match the cover at all, which is another area where several Villain’s Month issues have failed. More Justice League – #1-6, #7-12, #13-15, #22-23, #23.1, #23.2. Posted on September 29, 2013, in Comics Reviews, Review Central and tagged Alfred Pennyworth, Comics, Comics Reviews, Crime Syndicate of America, DC Comics, Earth 3, Geoff Johns, John Kalisz, Justice League, New 52, Owlman, Review, Review Central, Secret Society, Secret Society of Supervillains, Sterling Gates, Szymon Kudranski, Taylor Esposito, The Outsider, Villain's Month. Bookmark the permalink. 10 Comments.